Kindly note the image has been published only for representational purposes. 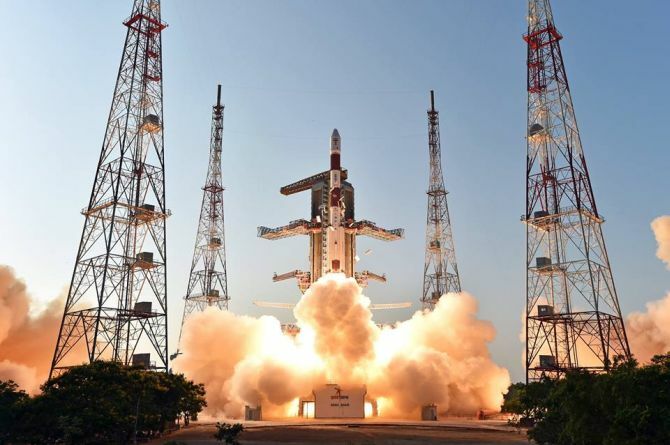 In a keenly waited telecast, Prime Minister Narendra Damodardas Modi announced on Wednesday, March 27, that India had shot down a low-orbit satellite, thus joining an elite list of nations that possessed the anti-satellite missile capability. Ajay Lele, Senior Fellow at the Institute of Defence Studies and Analyses, tells Rediff.com's Syed Firdaus Ashraf, "Till now we were going to the moon and mars and emerged as a power in the civilian domain, but now we have emerged in the military domain too." Can you explain for a layman what PM Modi's announcement of an anti-satellite missile system means? You fire a missile from the ground and that missile goes and destroys the satellite. After the satellite is destroyed, it gets fragmented into various small pieces which we called debris. If you destroy a satellite at a very high altitude, say above 500 to 600 km, then the debris remains there and creates problems for other satellites too. I think India must have done this (experiment) at a lower altitude where the debris may not have created any problem. At this moment, though, I have no idea at what height this (experiment) was carried out. How will this anti-satellite missile capability help India's defence preparedness? More than helping, India has demonstrated that if tomorrow, any enemy country that has a lot of satellites threatens it, India can (bring them down). During warfare also, if the need arises, we can take down satellites as they essentially give a lot amount of capability from a remote sensing point of view. If the enemy has to be defeated, then you can take out the capability of the enemy to do remote sensing or reconnaissance by taking down their satellite. Where does India stand in the world in terms of such a capability? India is the fourth country to have this. India has now emerged in space too as a military power. Till now we were going to the moon and mars and emerging as a power in civilian domain, but now we have emerged in the military domain too.